Have you ever considere­­­d having your wedding in August in Florida? Probably not, due to the hot, tropical temperatures. If you have not thought about it, you should. The mornings are cooler with a tropical breeze on the beaches, you can save money due to the fact the month of August is such a slow wedding time, wedding vendors and hotels, theme parks, and cruises are ready to negotiate August is the month for discounts in Florida. If you still are not convinced, think of having a sunrise wedding on the beach with no need for decorations. 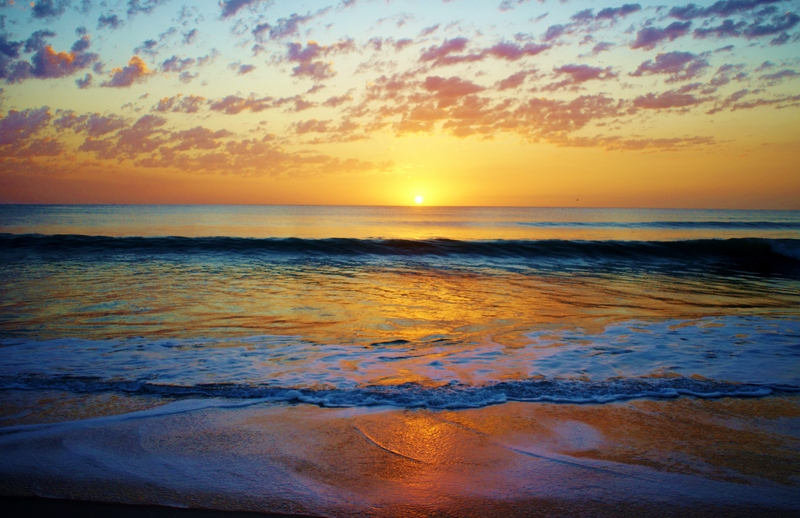 You will have a beautiful God given sunrise as your arch with golden sand at your feet. The only decor is already there. You could ask your guests to bring their own blankets and chairs but then again rentals for chairs will be ready to negotiate. If you want to have a color theme buy a bolt of fabric and make blankets for everyone to sit on. Have the reception at a nearby venue that will cater breakfast with juices, bagels, muffins or a full breakfast. Be sure to have a professional photographer to capture all the beauty. Your officiate will help you with a guideline where to stand and when to exchange your wedding vows at the precise time when the sun rises. Are you re- thinking an idea of an August wedding? Great! Call us. This entry was posted in August weddings, WEDDING AND PARTY ENTERTAINMENT DJ AND PHOTOGRAPHER, Wedding Cake, wedding etiquett, wedding photo packages, wedding photographers, wedding photography. Bookmark the permalink.